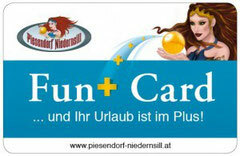 The Fun+ Card cannot be bought. It is a included in the accommodation price when you book in our "Mariandls Appartement" and provides you with the following benefits. Further reductions to the advantage card!